Decker Manufacturing is a Michigan-based manufacturer of industrial fasteners like nuts and pipe plugs. Decker’s products are used in the automotive, construction and agricultural industries. The company has been in business for 85 years. Decker Manufacturing is a true dark unlisted company. Decker does not file SEC reports or even provide quarterly or annual results on its own website. Investors in Decker must wait for the company’s physical annual report to show up in the mail. (The company might be willing to send information in response to requests, but I did not attempt this.) My annual report arrived on Monday. In addition to being one of the most informative and well-organized reports I have ever seen, it revealed a banner year for Decker. Revenues and earnings hit new highs, and the balance sheet grew stronger than ever. Revenues for 2012 rose to $34.17 million, up 9.6% from 2011. Earnings leaped to $2.28 million, up 56.1%. The company provides a five year income statement history in the annual report, which I have reproduced. The financial crisis of 2008 and 2009 did a number on the company’s sales and profits, but Decker has bounced back in a big way. From 2003 to 2012, Decker Manufacturing grew its top line at a very respectable 5.9%. Decker Manufacturing’s balance sheet is extremely strong and liquid. The company owns $10.5 million in cash and marketable securities, nearly half its market capitalization of $22.6 million. Total liabilities are $6.8 million and include notes payable of $4.2 million and a pension liability of $0.44 million. Ordinarily, pension plans at small manufacturing companies make me very nervous. However, Decker’s pension plan is closed to new participants and the return assumption of 7% is much more reasonable than many plans. The net pension liability amounts to 4.0% of shareholders’ equity and does not give me pause. The company’s marketable securities are worth just over $7 million, and are split roughly equally between fixed income mutual funds and equity mutual funds. Decker Manufacturing uses its marketable securities as a a sort of “ballast” for rough economic conditions. Even in 2009, when sales declined 32.4% and profits plunged to zero, the company paid a $1.00 per share dividend, funded from its reserves. Dividends seem to be somewhat of an obsession for Decker. Since 2008, the company has paid dividends of $9.20 per share, worth about 25% of the current share price. 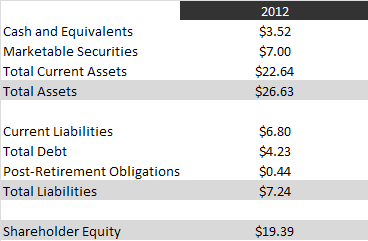 Decker earned a return on equity of 12.4% in 2012. Good, but not world-beating. However, Decker’s equity base is inflated by its mutual funds and excess cash. The current ratio is 3.3, indicating more than sufficient liquidity. If Decker returned its entire $7 million investment in marketable securities to shareholders, the current ratio would drop to a still healthy 2.3 and shareholders’ equity would fall to $12.4 million. On a backward-looking basis, return on equity would jump to a much more attractive 18.4%. Decker’s excess capital is hiding a high-quality business. If Decker reduced its dividend payout to 50% of earnings, I am willing to bet it could find some worthwhile projects to invest in. Decker Manufacturing’s share price mid-point is $37, giving the company a trailing P/E of 9.9. Net of cash and securities, the P/E is much lower. While it’s no once-in-a-lifetime bargain, Decker looks attractively priced. At the current earnings yield of 10.1%, even modest annual growth could push annual returns well north of what broad market indexes can offer. The company’s significant excess capital limits the risk of insolvency and provides some optionality, should the company ever decide to use it more productively. Decker Manufacturing’s chief risks are its tiny size and strong ties to the American industrial sector, which will inevitably experience booms and busts. I own one share of Decker Manufacturing. Thanks for the great blog, I am glad my friend referred it to me. Decker is a very interesting, hidden value; how did you find it though? How do you usually hunt for ideas? It’d be great if you could share some techniques to search for these hidden gems. I am afraid I don’t have much to offer in the way of techniques for finding promising unlisted stocks. I simply read quarterly and annual reports as they are filed on otcmarkets.com or through the SEC. The plainly worthless (no assets, no revenues, constant share dilution) companies are easy to spot and discard. Also, price matters. It is extraordinarily rare to find a legitimate company with a share price of less than 10 cents. On the other hand, higher-priced unlisted securities often show investment potential. 1. How do you assess governance/lack of it in such situations ? What data points do you look at given that the stock is illiquid, there is no frequent availability of information which can help triangulate data points ? 2. How do you buy these stocks OTC in the USA and how does the price get determined? Forgive my ignorance as I am not from the USA. A few thoughts. Assessing governance is always a soft science, but I rely on a few indicators to help. I prefer companies with a long history of success, both in terms of growth/profits and in terms of creating value for shareholders through dividends or increasing book value per share. I think good governance breeds success and a company’s own historical performance is the best evidence for or against good governance. I also like to see management significantly invested in the company–ideally owning stock worth multiples of their regular annual compensation. That helps convince me that management is interested in growing the company’s worth, not just racking up annual bonuses. On the other hand, management teams that own a large stake in the company sometimes view outside investors as nuisances to be rid of, not as partners. If the CEO writes an annual letter, that can be a valuable source of information on how he or she views outside shareholders. Unlisted stocks can be purchased through most major USA brokerage firms. They do not trade on a centralized stock exchange, so liquidity is often limited. Rather, unlisted stocks are sold directly from one broker-dealer firm to another. Many of these broker-dealers use a system called OTCLink to post offers and bids. To get at the spirit of your question, I have not found it difficult to purchase unlisted stocks. They do require more patience and more effort to acquire data than listed securities, but the actual buying and selling process is scarcely more complex than for listed securities. Do you have any insight into Federal Screw Works? They are a Michigan based competitor to Decker. Their ticker is FSCR. I think Federal Screw has more exposure to the auto industry than Decker does. I can’t tell you how many times I’ve driven past FSCR headquarters! FSCR went dark a few years ago. My family member who owned shares sold out close to 10 years ago, and I’ve lost track of how they have done. I notice that some shares crossed at $2.60/share. Back in the 90’s FSCR earned $7 or $8 share. I also think that FSCR dropped down to a quarter or so during the 08 crisis. Let me know if you’ve got any information on this. Hello again! I always appreciate your comments. I check up on FSCR from time to time. They’re really struggling and are in a race to cut costs before they are buried in debt or their suppliers get too nervous to transact with them. If I recall correctly, FSCR’s biggest customer is Ford. Ford has done as well or better than any other domestic auto maker since the crash, but their production is still not sufficient for FSCR to be able to cover its fixed costs. FSCR has been doing better, losing only 41 cents per share in 2012 compared to $3.72 per share in 2010. But they are running out of inefficiencies to wring out and staff to cut. Only the company’s strong working capital position has kept it going for this long. FSCR has about $41 million in net debt and retirement obligations compared to about $5 million in trailing EBITDA. That’s totally unsustainable and unless the auto industry gets hot in a hurry, it could be a sad end for a proud old company. When a company goes dark, are they required by law to send physical annual reports annually (automatically)? Can a company decide not send an annual report even after a request from an investor? I just received the 2014 report. Earnings rose 34% to $4.80 per share. Revenues were up 9%. At the current trading price, EV/EBIT is 5.4 and the P/E ratio is 10.4. Still cheap. You’ve put a great blog together. I’ve been on a tear the last day catching up on all of your posts since inception. It is quite an accomplishment! I’m curious, what platform do you use when you are purchasing one share in a dark company? What do they charge you and do you ever sell the share? Thanks for the kind words and glad you are enjoying the blog. Really, any regular brokerage will do the trick. Personally, I use Interactive Brokers. But I know many others like Fidelity or Schwab. I’ve also been a satisfied customer of TD Ameritrade in the past. Would you consider taking a look again in Federal Screw Works after the recent quarterly reports showing modest but sustainable growth in the company’s products? The cost cutting measures implemented by the company during the crisis have allowed it to enjoy the benefits of operating leverage and return to profitability. At the moment it is trading at a very cheap multiple and the company has started to build shareholder value through the increases in book value. My only concerns are the large sums of unfunded pension and healthcare liabilities and the excessive leverage taken by the company. In addition the company operates in very competitive industry where its customers have excessive pressure on small suppliers on terms of price and quality. I really enjoy your investment commentary and have read the majority of your articles in OTCAdventures as well as your letters(I am agonizingly waiting for the latest one) in Alluvial . The pension & healthcare benefits are most certainly a concern. HOWEVER, I don’t think they are quite as bad as what you think. I also VERY strongly suspect that book value is “under” reported. and is too low. These guys are heavily leveraged to the auto industry…but I don’t think it is as bad a business as what you think. If you go back through their historical results, they had some very good years. Very good years with little or no financial gearing. I never implied that they operate in a bad business. They just happen to be reliant to the auto industry which by itself its not a bad business but a cyclical one. I have read all their annual reports since 1996 before posting a comment in Mr. Waters article and I was surprised by their operating leverage , consistent profitability, book value growth and I understand how they came to their current situation. As for their pension and healthcare benefits they are certainly a major concern of me as their are historically high and they are great percentage of the equity!!! Several years have gone by…FSCR has done reasonably well! The stock price has also gone up a little bit. They have expanded sales, earnings, cash flow, and have also strengthened the balance sheet. Funnily, the stock is still trading for a P/E of about 3.5 after all of the improvements. They have some valuable real estate & buildings that may not be readily apparent….most certainly greater than the current market cap. They also have some hidden value in their inventory & WIP. They have also made some progress on strengthening their retiree benefits. Of course, they have had a rough time…they operate in a difficult industry, they are still leveraged…and on and on…they should trade for a discount…but a P/E of 3.5? Anybody know anything of DMFG?